Required to sign away their legal rights as authors as a condition of employment, professional writers may earn a tidy living for their work, but they seldom own their writing. 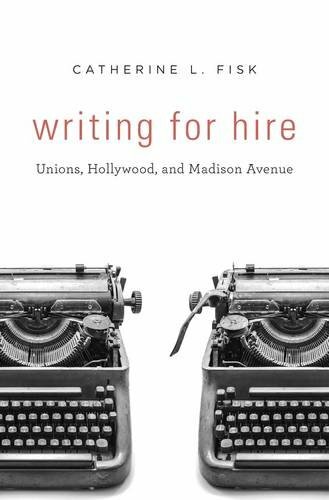 Writing for Hire traces the history of labor relations that defined authorship in film, TV, and advertising in the mid-twentieth century. Catherine L. Fisk examines why strikingly different norms of attribution emerged in these overlapping industries, and she shows how unionizing enabled Hollywood writers to win many authorial rights, while Madison Avenue writers achieved no equivalent recognition. In the 1930s, the practice of employing teams of writers to create copyrighted works became widespread in film studios, radio networks, and ad agencies. Sometimes Hollywood and Madison Avenue employed the same people. Yet the two industries diverged in a crucial way in the 1930s, when screenwriters formed the Writers Guild to represent them in collective negotiations with media companies. Writers Guild members believed they shared the same status as literary authors and fought to have their names attached to their work. They gained binding legal norms relating to ownership and public recognition―norms that eventually carried over into the professional culture of TV production. In advertising, by contrast, no formal norms of public attribution developed. Although some ad writers chafed at their anonymity, their nonunion workplace provided no institutional framework to channel their demands for change. Instead, many rationalized their invisibility as creative workers by embracing a self-conception as well-compensated professionals devoted to the interests of clients.